Promise of Paradise - Rejoice Abu Amr!! Sa’ad ibn Mu'adh (Arabic: سعد ابن معاذ‎) was the chief of the Banu Aws tribe in Madinah and one of the prominent companions of Rasulullah ﷺ during early Madinan period who died shortly after the Battle of the Trench or Khandak. Look! Do you see that handsome, gallant, tall man with a radiant face? He is the one. Sa'ad Ibn Mu’adh RA. from the Dakwah of Musaib Ibn Umayr RA. Sa'ad Ibn Mu’adh ran quickly to As'ad Ibn Zurarah to see this man who came from Makkah, Musa’ab Ibn 'Umair RA, whom Rasulullah ﷺ had sent to Al-Madinah to call people to commit themselves to Islam and monotheism. 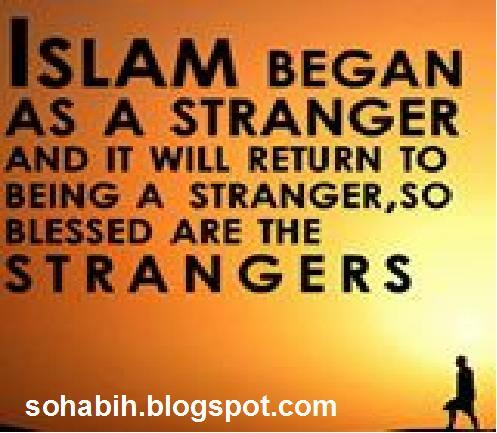 Sa'ad Ibn Mu’adh was going there to drive this stranger out of Al-Madinah along with his religion! But no sooner had he approached Musa'ab's assembly at the house of his nephew, As'ad Ibn Zurarah, than his heart was revived by a sweet pacifying breeze. No sooner had he reached those men who gathered there, taken his place among them and listened intently to Musa’ab's words than Allah The Most Exalted guided him to the right path that illuminated his heart and soul. In one of the incredible miracles of fate, the leader of the Ansar put aside his spear and shook hands with Musa’ab ibn Umair RA as a sign of his allegiance to Rasulullah ﷺ. A new sun shone above Al-Madinah as soon as Sa'ad Ibn Mu'adh RA committed himself to Islam. It would encompass many hearts that would revolve in the sphere of Islam later on. 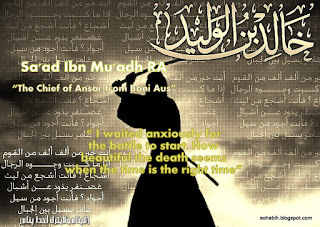 Sa'ad Ibn Mu'adh RA committed himself to Islam and withstood the hardships that ensued with much heroism and greatness. When Rasulullah ﷺ emigrated to Al-Madinah, the houses of Bani Al-Ashhal — Sa’ad's tribe — welcomed the Muhajirun, and their money was utterly at their disposal without arrogance, abuse, or limitation. When the Battle of Badr was about to take place, Rasulullah ﷺ gathered his Companions, both Ansar and Muhajirun, to consult them on the preparations for war. His amiable face turned towards the Ansar and he addressed them saying, "I want to know your opinion about what should be done concerning the imminent battle." Sa'ad Ibn Mu'adh RA stood up and said "O Rasulullah, we firmly believe in you, and we witness that what descends on you is the truth. We swore a solemn oath and gave you the allegiance, so go ahead with whatever you want, and we shall stand by your side. We swear by Allah Who has sent you with the truth that if you reach the sea and cross it, we will cross it hand in hand with you. No man will lag or stay behind. We are absolutely ready to go to war against our enemy tomorrow for we are given to terrible warfare and we are sincere in our desire to meet Allah. I hope that Allah will make us do what will make you proud of us. So go on with whatever is in your mind. Allah blesses you." Sa'ad Ibn Mu'adh RA's words made Rasulullah ﷺ’s face brighten with satisfaction and happiness as he addressed the Muslims and said, "Rejoice, for Allah promised me one of the two parties of the enemy (either the army or the caravan). By Allah I can almost see with my own eyes where each one of the enemy will be killed." In the Battle of Uhud, the Muslims lost control and dispersed as they were taken by surprise by the army of disbelievers. Everything was hectic, yet Sa'ad Ibn Mu'adh RA stood there as if pinned to the ground next to Rasulullah ﷺ. He defended him courageously as a noble warrior should do. The Battle of Al-Khandaq came as a suitable opportunity for Sa'ad Ibn Mu'adh RA to show his admirable manliness and amazing valor. The Khandaq Battle came as a clear sign for the shrewd and deceitful schemes with which Muslims were being ruthlessly haunted by an enemy who had no consideration whatsoever for justice or covenant. For while Rasulullah ﷺ and his Companions were living in Al-Madinah in peace, reminding one another to worship and obey Allah, hoping that the Quraish would refrain from their hostility, a group of Jewish leaders stealthily headed for Makkah to instigate the Quraish against Rasulullah ﷺ. The Jews pledged to help the Quraish if they decided to raid Al- Madinah. They made an agreement with the disbelievers and even laid down the battle plan. Moreover, on their way home they incited Bani Ghatafan — one of the biggest Arab tribes —and made an agreement with its leaders to join forces with the Quraish army. Illustration Only: His longing for martyrdom. The war plan was ready and everyone knew his role. The Quraish and Ghatafan were to attack Al-Madinah with an enormous army, whereas the Jews were to sabotage Al-Madinah simultaneously with the attack. When Rasulullah ﷺ found out the treacherous scheme. Rasulullah ﷺ resorted to counter the plot. First, he ordered his Companions to dig a trench around Al-Madinah to hold back the attackers. Second, he sent Sa'ad Ibn Mu'adh RA and Sa'ad Ibn 'Ubadah RA to Ka'b Ibn Asad, the leader of Bani Quraizah, to learn exactly where they stood concerning the imminent war. At that time, mutual agreements and treaties were already signed between Rasulullah ﷺ and the Jews of Bani Quraizah. The two messengers of Rasulullah ﷺ met with the Jewish leader, yet to their surprise he denied the agreement by saying, "We did not sign any agreement or treaty with Muhammad." It was hard for Rasulullah ﷺ to expose the people of Al-Madinah to such a deadly invasion and exhausting siege; therefore, the only answer was to neutralize Ghatafan so that the attacking army would lose half of its men and strength. Rasulullah ﷺ began to negotiate with the Ghatafan leaders so that they would forsake the Quraish in exchange for one third of Al-Madinah’s crops. The leaders of Ghatafan accepted this agreement, and both parties were to sign it shortly. Rasulullah ﷺ could not go any further without consulting his Companions. Rasulullah ﷺ valued Sa'ad Ibn Mu'adh RA and Sa'ad Ibn 'Ubadah’s opinion, for they were the leaders of Al- Madinah and had the right to have a say in any decision that affected it. Rasulullah ﷺ told them about his negotiations and that he had resorted to this compensation lest Al-Madinah and its inhabitants be exposed to this dangerous attack and horrible siege. Both Sa’ad’s asked Rasulullah ﷺ "Is it a matter of choice or is it an inspiration from Allah?" Rasulullah ﷺ answered, "It is actually a matter that I chose for you. By Allah, I only do this because I can clearly see that the Arabs joined forces to strike you as one man so I want to curb their strength." Sa'ad Ibn Mu'adh RA had the intuition that their fate as men and as believers was being subtly tested so he said, "O Messenger of Allah, when we and those Jews were disbelievers and polytheists, they did not even dream of eating a date from our land unless we gave it to them out of generosity, hospitality, or for trade purposes. So how is it, after Allah has guided us to Islam and made us honored by it and by you, that we give them our money? By Allah, we can do without this agreement, and we will give them nothing but warfare until Allah settles our dispute." Rasulullah ﷺ at once changed his mind and notified Ghatafan leaders that his Companions rejected the proposed agreement and that he approved and supported their opinion. 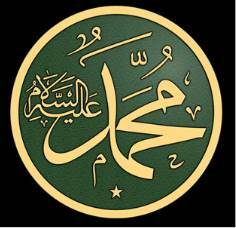 The pious companion of Prophet Muhammad SAW. A few days later Al-Madinah witnessed a horrible siege. It was, in fact, a siege which it brought upon itself rather than was forced upon it due to the trench that was dug as a protection and safely procedure. The Muslims were prepared for war. 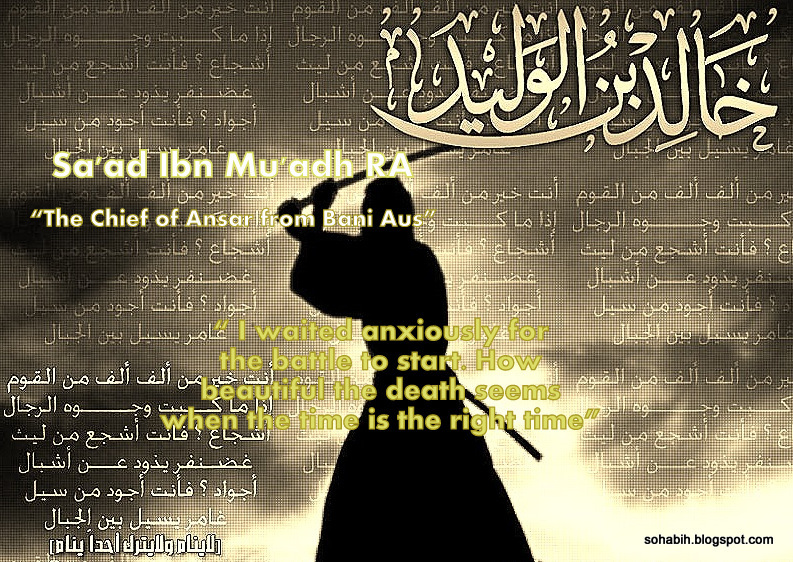 Sa'ad Ibn Mu'adh RA marched around with his sword and spear and recited lines of poetry that mean, "I waited anxiously for the battle to start. How beautiful death seems when the time is the right time." In one of the rounds of war, Sa’ad’s arm was showered with the arrows of one of the disbelievers, and blood gushed severely from his wounds. Sa'ad Ibn Mu'adh RA received first aid assistance to stop the bleeding, and then Rasulullah ﷺ ordered him carried to the mosque where a tent was put up so that he would be near Rasulullah ﷺ while he was nursed. The Muslims carried their great hero into the Rasulullah's mosque and Sa'ad Ibn Mu'adh RA looked up to the sky and said, "O Allah our Lord, if the war against the Quraish is to last any longer, please do let me live a little while longer to fight against them, for I like nothing better than fighting those people who hurt Your Rasul, disbelieved him, and even drove him to emigrate. But if the war has already ended, please make my wounds pave my way to martyrdom. I implore You, dear Allah, not to let me die until I avenge myself upon Bani Quraizah!" Allah will stand by you, Sa'ad Ibn Mu'adh! For who could say such a thing in such a situation but you? Allah did fulfill his supplication. His injury caused his death a month later, but he did not die until he had taken his revenge on the Jews of Bani Quraizah. After the Quraish became desperate in their attempt to vanquish Al-Madinah and their soldiers were gripped by panic, they took their arms and equipment and returned to Makkah ashamed and disappointed. Rasulullah ﷺ believed that Al-Madinah had been compromised by the deceit and treachery of the Jews for too long. They left the Muslims in the lurch whenever they chose, a thing that Rasulullah ﷺ could no longer accept. Therefore, he ordered his Companions to march towards Bani Quraizah, and there the Muslims besieged them for 25 days. When the Jews were certain that there was no escape from the Muslims, they pleaded with Rasulullah ﷺ to let Sa'ad Ibn Mu'adh RA, their ally in pagan times, decide what would become of them. Rasulullah ﷺ sent his Companions to bring Sa'ad Ibn Mu'adh RA from his tent at the mosque. 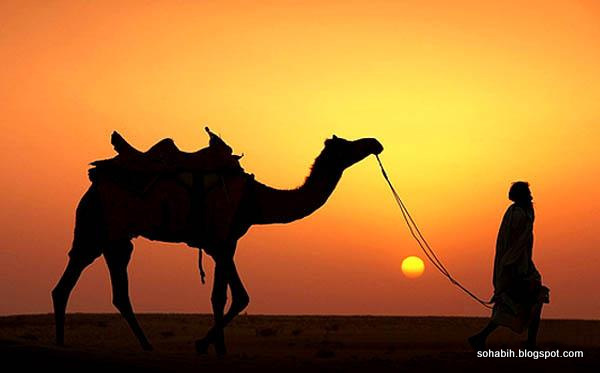 Sa'ad Ibn Mu'adh RA came carried on a camel and he looked so pale and sick. Rasulullah ﷺ addressed him, “Sa’ad Ibn Mu'adh, decide what should be done to Bani Quraizah." Sa'ad Ibn Mu'adh RA remembered their treachery and deceit in general and in the Battle of Al Khandaq in particular, when Al-Madinah had come too close to its ruin, and said, "I say kill their warriors, capture their children, and distribute their money." Thus Sa'ad Ibn Mu'adh RA did not die until he had taken his revenge. Sa'ad Ibn Mu'adh RA’s wounds became worse every day. One day, Rasulullah ﷺ visited Sa'd and found him on the verge of death, so Rasulullah ﷺ put his head on his blessed lap and called upon Allah, "O Allah, Our Lord, Sa'ad has striven hard in the way of Allah. Sa’ad believed in Your Prophet and did his very best. So please do accept his soul with goodly acceptance." The words of Rasulullah ﷺ fell like coolness and safety on the departing noble soul. Sa'ad Ibn Mu'adh RA strove to open his eyes, hoping that the last face he saw would be the Prophet's and said, ". ﷺ Ya Rasulullah! I do witness that you are indeed the Messenger of Allah." 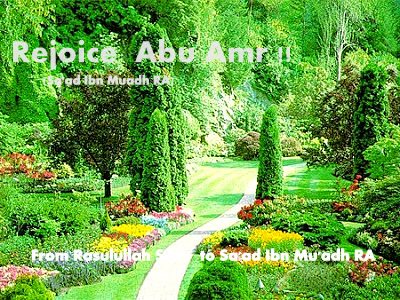 Rasulullah ﷺ took a farewell look of Sa'ad Ibn Mu'adh RA's face and said, "Rejoice, Abu ‘Amr." 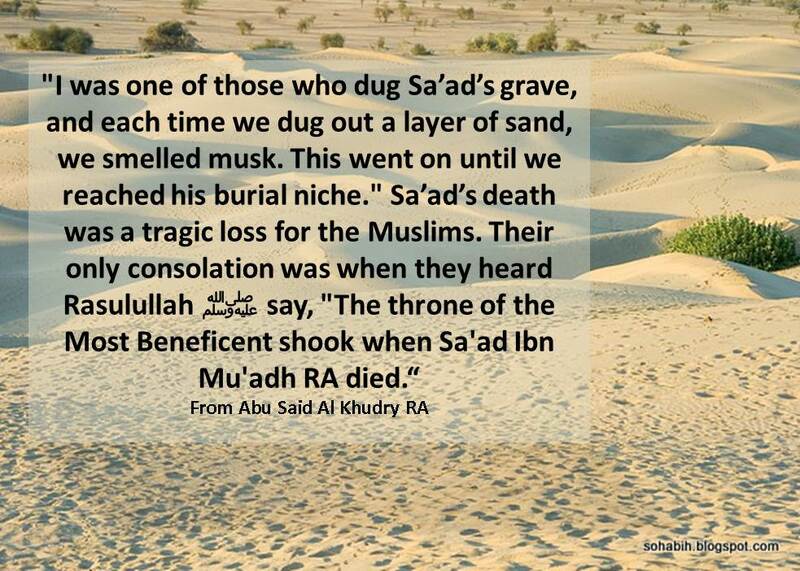 Abu Sa’id Al-Khudriy RA said, "I was one of those who dug Sa’ad’s grave, and each time we dug out a layer of sand, we smelled musk. This went on until we reached his burial niche." 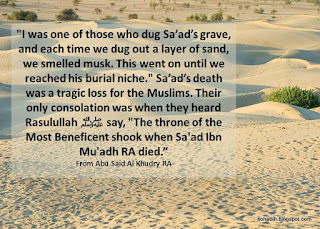 Sa’ad’s death was a tragic loss for the Muslims. Their only consolation was when they heard Rasulullah ﷺ say, "The throne of the Most Beneficent shook when Sa'ad Ibn Mu'adh RA died." Selected Hadiths Narrated by and Attributed to Sa’ad ibn Mu’adh RA. Yahya related to me from Malik from Nafi from a man of the Ansar from Muadh Ibn Sad or Sad Ibn Muadh that a slave-girl of Kab Ibn Malik was herding some sheep at Sal (a mountain near Madina). One of the sheep was about to die, so she went over to it and slaughtered it with a stone. Rasulullah ﷺ was asked about that, and he said, "There is no harm in it, so eat it." Yahya related to me from Malik from Zayd Ibn Aslam from Amr Ibn Sad Ibn Muadh from his grandmother that Rasulullah ﷺ said, "O trusting women, none of you must consider even a roasted sheep's trotter too small to give to her neighbor." Yahya related to me from Malik from Yahya Ibn Said from Wafid Ibn Amr Ibn Said Ibn Muadh from Nafi Ibn Jubayr Ibn Mutim from Masud Ibn al-Hakam from AIi Ibn Abi Talib that Rasulullah ﷺ used to stand up when a funeral procession passed by, and then sit down again afterwards. "O Allah! I apologize to You for what these (i.e. his companions) have done, and I denounce what these Mushrikun (i.e. the pagans) have done." His sister Ar-Rubai broke a front tooth of a woman and Allah's Rasul ﷺ ordered for retaliation. On that Anas (bin An-Nadr) said, "O Allah's Rasul ﷺ By Him Who has sent you with the Truth, my sister's tooth shall not be broken." Then the opponents of Anas's sister accepted the compensation and gave up the claim of retaliation. So Allah's Rasul ﷺ said, "There are some people amongst Allah's slaves whose oaths are fulfilled by Allah when they take them." A Jubba (i.e. cloak) made of thick silken cloth was presented to Rasulullah ﷺ. Rasulullah ﷺ used to forbid people to wear silk. So, the people were pleased to see it. Rasulullah ﷺ said, "By Him in Whose Hands Muhammad's soul is, the handkerchiefs of Sa’ad bin Muadh in Paradise are better than this." Anas added, "The present was sent to Rasulullah ﷺ by Ukaidir (a Christian) from Dauma." Thabit bin Qais RA confined himself in his house and said: I am one of the denizens of Fire, and he deliberately avoided coming to Rasulullah ﷺ. Rasulullah ﷺ asked Sa’ad bin Muadh about him and said, Abu Amr, how is Thabit? Has he fallen sick? Sa’ad bin Mu’adh RA said: He is my neighbor, but I do not know of his illness. Sa’ad bin Mu’adh RA came to him (Thabit), and conveyed to him the message of Rasulullah ﷺ. Upon this Thabit said: This verse was revealed, and you are well aware of the fact that, amongst all of you, mine is the voice louder than that of Rasulullah ﷺ, and so I am one amongst the denizens of Fire, Sa’ad bin Mu’adh RA Informed Rasulullah ﷺ about it. Upon this Rasulullah ﷺ observed: (Nay, not so) but he (Thabit) is one of the dwellers of Paradise. (The wife of Rasulullah ﷺ) "Whenever Rasulullah ﷺ intended to go on a journey, he would draw lots amongst his wives and would take with him the one upon whom the lot fell. During a Ghazwah of his, he drew lots amongst us and the lot fell upon me, and I proceeded with him after Allah had decreed the use of the veil by women. I was carried in a Hawdaj (on the camel) and dismounted while still in it. When Rasulullah ﷺ was through with his Ghazwah and returned home and we approached the city of Madinah, Rasulullah ﷺ ordered us to proceed at night. When the order of setting off was given, I walked till I was past the army to answer the call of nature. After finishing I returned (to the camp) to depart (with the others) and suddenly realized that my necklace over my chest was missing. So, I returned to look for it and was delayed because of that. The people, who used to carry me on the camel, came to my Hawdaj and put it on the back of the camel, thinking that I was in it, as, at that time, women were light in weight, and thin and lean, and did not use to eat much. So, those people did not feel the difference in the heaviness of the Hawdaj while lifting it, and they put it over the camel. At that time I was a young lady. They set the camel moving and proceeded on. I found my necklace after the army had gone, and came to their camp to find nobody. So, I went to the place where I used to stay, thinking that they would discover my absence and come back in my search. While in that state, I felt sleepy and slept. Safwan bin Muattal As-Sulami Adh-Dhakwani was behind the army and reached my abode in the morning. When he saw a sleeping person, he came to me, and he used to see me before veiling. So, I got up when I heard him saying, "Inna lil-lah-wa inn a ilaihi rajiun (We are for Allah, and we will return to Him)." He made his camel knell down. He got down from his camel, and put his leg on the front legs of the camel and then I rode and sat over it. Safwan set out walking, leading the camel by the rope till we reached the army who had halted to take rest at midday. Then whoever was meant for destruction, fell into destruction, (some people accused me falsely) and the leader of the false accusers was Abdullah bin Ubai bin Salul. After that we returned to Madinah, and I became ill for one month while the people were spreading the forged statements of the false accusers. Sa’ad bin Muadh RA got up and said, 'O Rasulullah ﷺ! by Allah, I will relieve you from him. If that man is from the tribe of the Aus, then we will chop his head off, and if he is from our brothers, the Khazraj, then order us, and we will fulfill your order.' On that Sa’ad bin Ubadah RA, the chief of the Khazraj and before this incident, he had been a pious man, got up, motivated by his zeal for his tribe and said, 'By Allah, you have told a lie; you cannot kill him, and you will never be able to kill him.' On that Usaid bin Al-Hadir got up and said (to Sa’ad bin Ubadah), 'By Allah! You are a liar. By Allah, we will kill him; and you are a hypocrite, defending the hypocrites.' On this the two tribes of Aus and Khazraj got excited and were about to fight each other, while Rasulullah ﷺ was standing on the pulpit. Rasulullah ﷺ got down and quietened them till they became silent and he kept quiet. On that day I kept on weeping so much so that neither did my tears stop, nor could I sleep. In the morning my parents were with me and I had wept for two nights and a day, till I thought my liver would burst from weeping. While they were sitting with me and I was weeping, an Ansari woman asked my permission to enter, and I allowed her to come in. She sat down and started weeping with me. While we were in this state, Rasulullah ﷺ came and sat down and he had never sat with me since the day they forged the accusation. No revelation regarding my case came to him for a month. Rasulullah ﷺ recited Tashahhud (i.e. 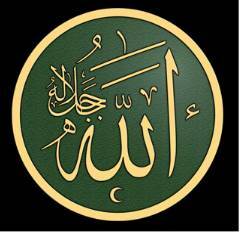 none has the right to be worshipped but Allah and Muhammad is His Rasul ﷺ and then said, 'O Aisyah! I have been informed such-and-such about you; if you are innocent, then Allah will soon reveal your innocence, and if you have committed a sin, then repent to Allah and ask Him to forgive you, for when a person confesses his sin and asks Allah for forgiveness, Allah accepts his repentance.' When Rasulullah ﷺ finished his speech my tears ceased completely and there remained not even a single drop of it. "Verily! They who spread the slander are a gang among you . . ."
“And let not those who are good and wealthy among you swear not to help their kinsmen, those in need and those who left their homes in Allah's Cause. Let them forgive and overlook. Do you not wish that Allah should forgive you? Verily! 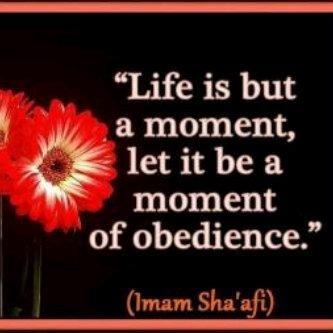 Allah is Oft-forgiving, Most Merciful." After that Saidina Abu Bakr RA said, 'Yes ! By Allah! I like that Allah should forgive me,' and resumed helping Mistah whom he used to help before. Rasulullah ﷺ also asked Zainab bint Jahsh (i.e. Rasulullah ﷺ)'s wife about me saying, 'What do you know and what did you see?' She replied, 'O Rasulullah ﷺ I refrain to claim hearing or seeing what I have not heard or seen. By Allah, I know nothing except goodness about Aisyah." Aisyah further added "Zainab was competing with me (in her beauty and Rasulullah ﷺ 's love), yet Allah protected her (from being malicious), for she had piety."